And just like that, it’s officially summer! Well, okay fine, unofficially, but we all know that Memorial Day is totally the marker for the start of the season. Plus, it’s hot. And the heat has some sort of magical power that brings on my complete and utter laziness when it comes to cooking dinner. 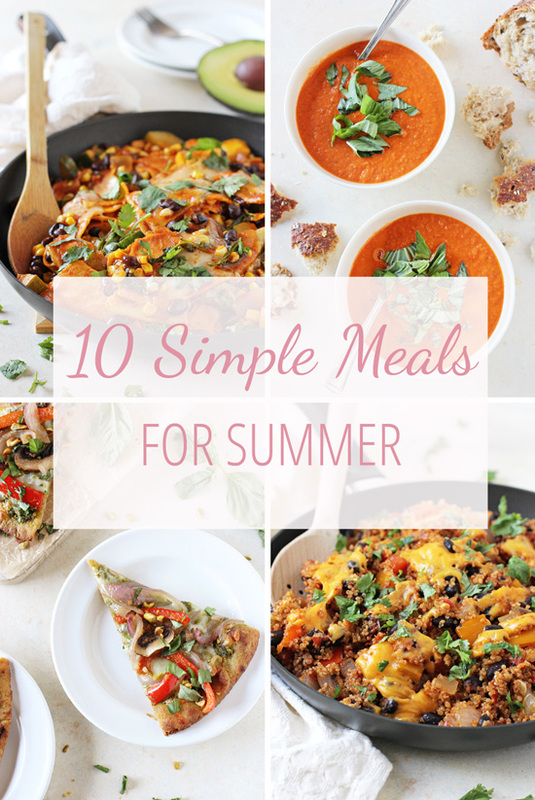 So, it seems like an appropriate time to chat about these 10 simple meals for summer! They are all recipes from the archives that I wanted to bring back to your attention – show em’ a little love! Because man, are they deeeelicious. All are 100% easy, quick and completely satisfying (umm, we need to fuel up for all that lounging around by the pool with popsicles, yes?!). I’m pretty sure that low maintenance is the only way to go during the lazy days of the season! So, three cheers for sunshine and popsicles and flip-flops and of course, simple meals! Let’s do this! 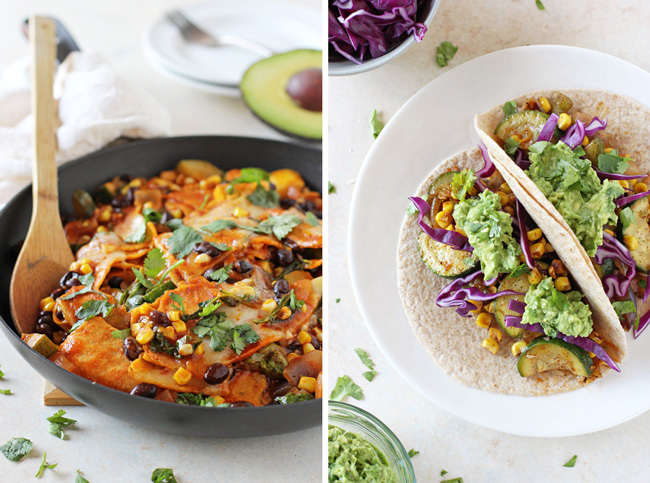 Summer Vegetable Skillet Enchiladas // All-time favorite recipe! We’re talking 30 minutes, one skillet and all the goodness of enchiladas without the hassle of rolling them up! 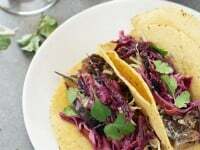 Zucchini and Corn Tacos with Guacamole // These guys are packed with summer veggies and are on the table in 30 minutes or less. Plus, tacos. <— Always a good thing. Roasted Cherry Tomato Soup // Healthy, creamy, homemade tomato soup. Yes, you have to roast the tomatoes first, but it couldn’t be easier! And when served with crusty bread OR grilled cheese??? Heaven. Southwest Egg Scramble // For when you’re really feeling the lazy vibes of summer. Just 20 minutes to this healthy, flavorful meal. And you MUST serve with avocado toast. Must! 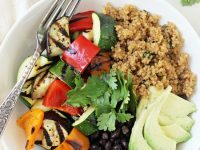 Stuffed Pepper Quinoa Skillet // Colorful, healthy & SO MUCH easier than making actual stuffed peppers! Plus, there’s only one skillet required. Awesome. 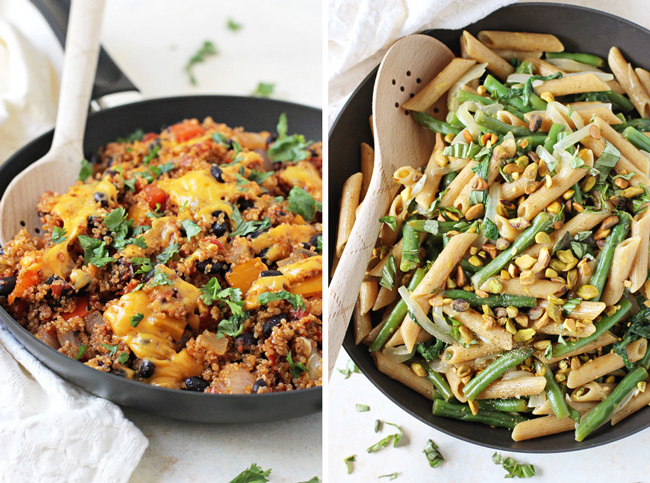 Lemon Garlic Pasta Skillet with Green Beans // 35 minutes! One pot! Fresh, light AND there’s pistachios involved. Nuff said. Spicy Broccoli Carrot Noodle Stir-Fry // With a flavorful spicy soy sauce and just a touch over 30 minutes to pull it together, this meal is hard to resist. And I mean, oodles of noodles! You just can’t beat that. Veggie and Pesto Flatbread Pizza // With naan bread as the base, a pistachio pesto and plenty of colorful veggies! Need I say more? 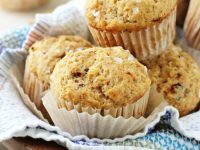 And now, let’s talk a few recipes from some of my blogging friends! 30-Minute Caprese Pasta Skillet from Flavor the Moments // Because caprese anything is always a good thing! Grilled Portabella Hummus Wraps from Making Thyme for Health // I’ve made these several times and cannot get enough! Pickle the veggies in advance and the rest is super quick! Now don’t you worry, I have plenty more summer recipes coming your way over the next few months! Hip hip hooray! 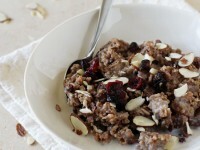 You’ve got such an awesome collection of recipes on your site! Seeing all of them is getting me pumped for summer produce. Our farmers market has tomatoes this week so it’s about that time! Every single meal looks amazing Ashley, great tribute to summer and all it’s goodness. All of these meals look so exotic and delicious, Ashley. 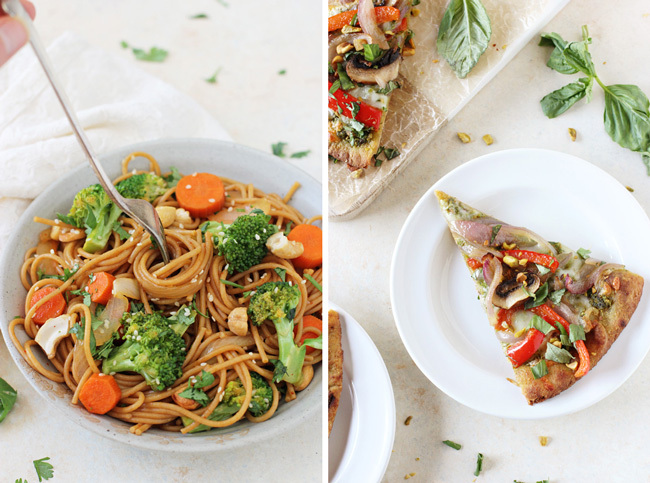 Loving everything, but that veggie and flatbread pesto pizza is making me drool. YUM! 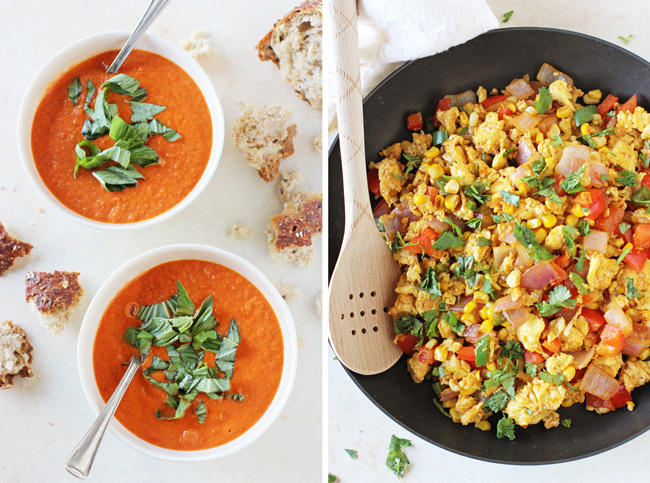 These meals are just perfect for the hot summer days, Ashley! Awesome recipes! Oooh yummy, everything looks delicious! I totally made your skillet enchiladas last year – and I will be making them again sometime soon! I just want to eat at your house everyday! Okay…barring that, I guess I have to settle for your knockout, tasty and healthy recipes. : ) Great ideas here, Ashley. Hope you had a great weekend. haha you are welcome here anytime Monica!! Wow Ashley, they all look so good…thanks for the links! Your summer vegetable enchilada skillet is a regular in our rotation! 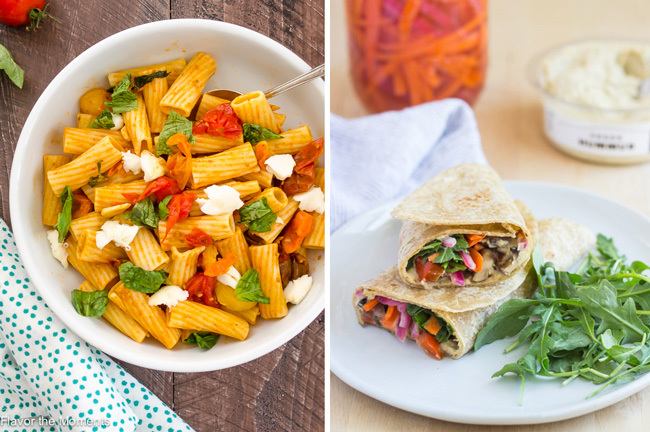 Love all of these easy summer meals! Thank you for bringing these back to my attention! I especially love the enchilada skillet and the quinoa pepper skillet, and Sarah’s hummus wraps do sound truly amazing. Thanks so much for including my caprese pasta and Happy Monday Ashley! Of course – it looks delicious!! Hope you had a great weekend! YAY for the unofficial start of summer! Bring on ALL the summer deliciousness. 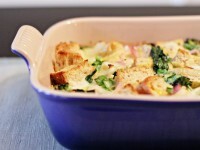 Your recipe roundup looks perfect, Ashley! Such a great collection and I think I want everything, especially that egg scramble and veggie pesto pizza. Looks wonderful, friend!